The Škoda 1000 MB/1100 MB were two variations of a rear-engined, rear-wheel drive car that was produced by Czechoslovakian manufacturerAZNP in Mladá Boleslav between 1964 and 1969. 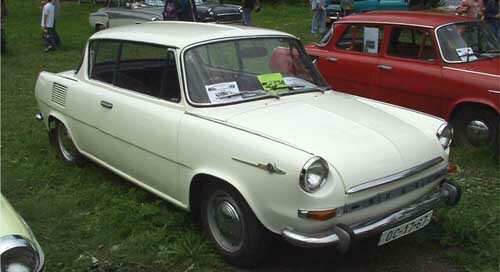 The two-door Coupé versions of the 1000 MB and 1100 MB were called the 1000 MBX and1100 MBX. In 1955, the same year in which the Škoda 440/445 made its first appearance, Škoda started making plans for a new car for the 1960s. The initial plans for the car were to make the car as light and fuel-efficient as possible: it was to weigh no more than 700 kg, and the overall fuel consumption was not to exceed 6-7 litres per 100 kilometres (33-38mpg). The next step was to produce the car as a four-door saloon, which would be built using monocoque construction. Like most leading car manufacturers dating from before the Second World War, Škoda always built their cars using the traditional and well-proven front-engine and rear-wheel drive layout. However, Škoda decided to look at two alternative options. Their first option was to go for the more modern front-engine and front-wheel drive layout, and their second option was to use the rear-engine and rear-wheel drive layout, if the first option was unsuccessful. 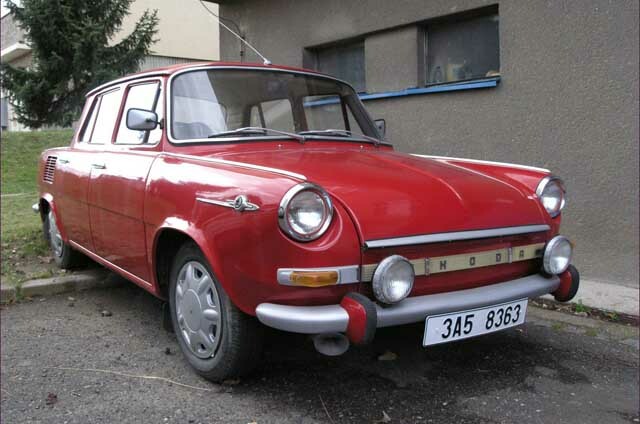 The front-engined-with-front-wheel-drive option was unsuccessful due higher cost and design complexity, and therefore Škoda opted for the rear-engined-with-rear-wheel-drive format. Even by the early 1960s, the idea of rear-engined small family saloons was still considered to be reasonably popular. 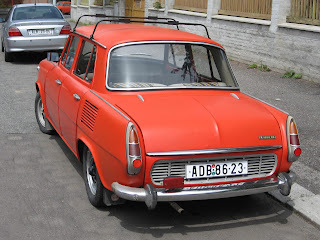 In France, there were the Renault Dauphine, Renault 8 and Simca 1000, while in Germany there were the Volkswagen Beetle and NSU Prinz, in Italy there were the Fiats 500 and 600, and in Britain there was the Hillman Imp, all of which employed the rear-engined concept. 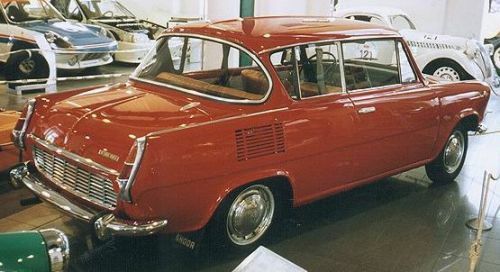 The Škoda 1000 MB made its debut in April 1964, as the successor for the Octavia. The letters MB were abbreviated for Mladá Boleslav. 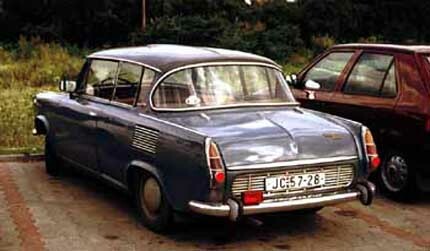 The 'MB was just the beginning of what would eventually evolve into a long line of rear-engined Škodas. The 1000 MB was powered by a rear-mounted, water-cooled, 988cc, four-cylinder overhead valve engine, which produced 44 bhp (33 kW). An interesting thing about this engine was the combined use of an aluminum block with a cast iron cylinder head. The 1000MB was a stylish four-door saloon, measuring 4.1 meters in length and 1.6 meters in width, which featured a steeply sloping nose that was flanked by rounded front wings (not unlike the Ford Anglia 105E of the time). Being a rear-engined car, the 1000MB's radiator and (engine-propelled) cooling fan were situated in the rear engine compartment, so therefore a series of slats were cut into each rear wing and the rear panel to increase the flow rate of air in order to assist in keeping the engine cool. Apart from the use of cooling vents in the rear wings and rear panel, everything else about the car's styling was normal, which was undoubtedly in an attempt to appeal to all the conservative-minded buyers in export countries like the UK. This car was highly successful for Škoda and the Czechoslovak economy. By early 1965, the British were starting to receive the 1000 MB, which was being priced at a reasonable £579, which was cheaper than similarly sized four-door saloons such as the Ford Cortina 1200 and Hillman Minx Deluxe, which cost £592 and £636 respectively. Despite being affordably priced, the 1000 MB came well equipped, with all-independent front suspension, reclining front seats, a heater and demister, full tool kit, and a generously sized boot up front as well as useful storage areas behind the folding rear seat. Many salesmen over the years rightly stated that the MB was "a lot of car for the money". For a small/medium-sized car with a 1-litre engine, the 1000 MB gave acceptable performance. The top speed was 120 km/h (75 mph), reaching 100 km/h (62 mph) from standstill in 27 seconds. Overall fuel economy was around 6.5 l/100 km (36 mpg). By August 1969, Škoda felt it was time to update the 'MB series, which they did with the introduction of theŠkoda S100/110 series. By the time it was updated, a total of 443,903 'MBs were built. The 'MBX series was produced in very limited numbers (2,517 in total) and is therefore quite a rarity these days. 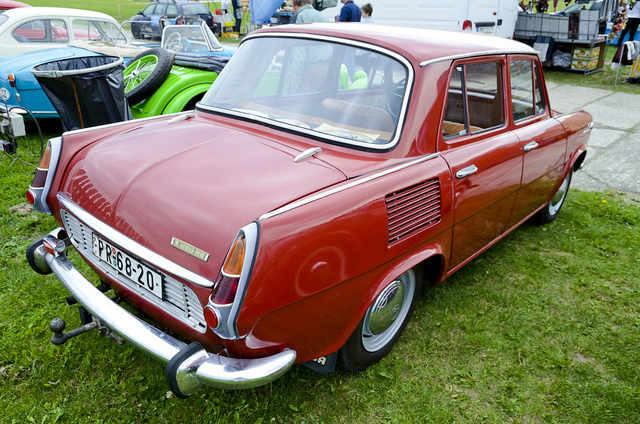 All Škoda 1000 MB had corrosion problems, particularly at the door sills and the axle suspensions. The vehicles were quick to rust, even with regular cavity sealing. Another serious problem was a blown cylinder head gasket because of engine overheating. Temporarily, the cars were delivered with a spare canister of coolant water; the plastic container was in the right rear fender. 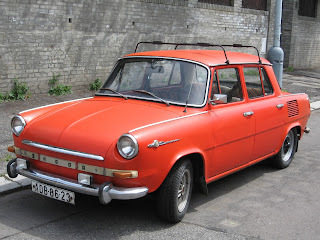 The cooling problems were so bad that often in the summer it was necessary to drive with the heater switched on to prevent overheating of the engine. 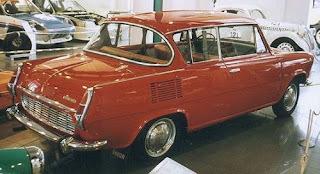 April 2, 1964 - Introduction of the 1000 MB (Type 990) four-door saloon. It had a rear-mounted 988cc four-cylinder engine giving 42 hp (31 kW) at 4650 rpm. April 1, 1966 - Introduction of the 1000 MB de Luxe (Type 721) four-door saloon with a more powerful 48 hp (36 kW) version of the 988 cc engine. It had better trim than the standard 'MB. 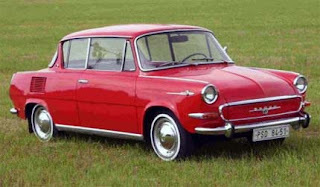 April 3, 1966 - Introduction of the 1000 MB (Type 721) and 1000 MBG de Luxe (Type 710) four-door saloons and 1000 MBX de Luxe 2-door coupe (Type 990T). 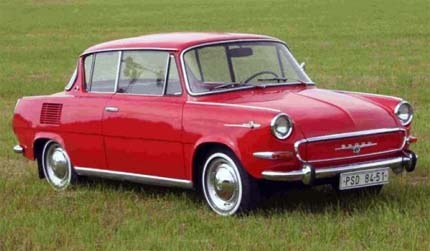 The standard 1000 MB now had the same engine as the MB de Luxe, while the 'MBG and 'MBX had a twin carburettor 52 kW version of the same engine. April 1, 1968 - Introduction of the 1100 MB de Luxe and 1100 MBX de Luxe (Types 715 and 723 respectively). Both were much the same as the earlier 1000 MB de Luxe and 1000 MBX de Luxe only they had a bigger 1107cc engine giving 52 hp (39 kW). The 1000MBX was discontinued at this point. September 1969 - All 'MB series replaced by the new S100 series. Last updated on 10 April 2013 at 15:14.